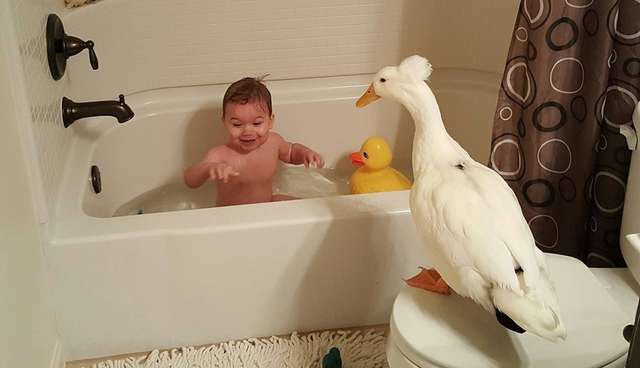 This lucky little boy bathes with a rubber ducky, and a real ducky, too. Tyler, the mini-human, is about a year and a half old now. Beaker the duck - otherwise known as Bee - has been Tyler's best friend since he joined the Texas household as a wee duckling, around nine months ago. 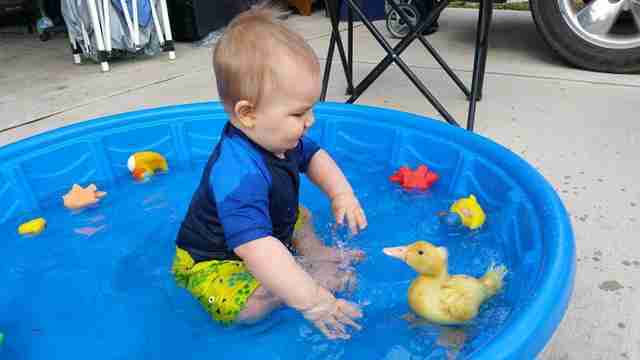 Tyler's first word, in fact, was "duck," says Tyler's mom, Jennifer Young. Their bond has only grown, as the unlikely buddies have together grown into a pair of adorable toddlers. 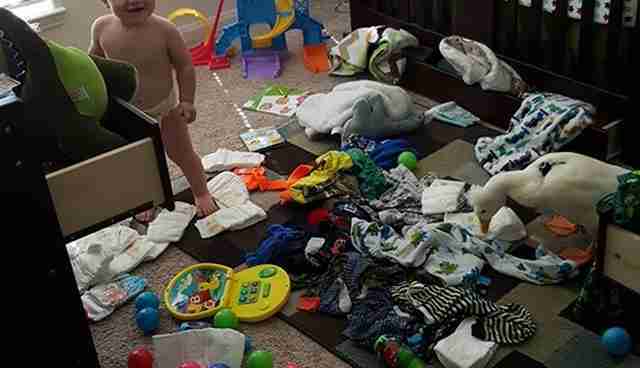 "From the time these two get up till the time they go to bed, it's chaos," says Young, affectionately. Bee begs for food while Tyler is eating - and Tyler obliges. They romp around like a couple of puppies. Young says the two can tear Tyler's room apart in five minutes flat, and then look equally guilty when she catches them. Bee is also "very protective of his boy. If I am holding Tyler and he's crying, Bee is at my feet quacking, making sure he's not hurt," Young says. 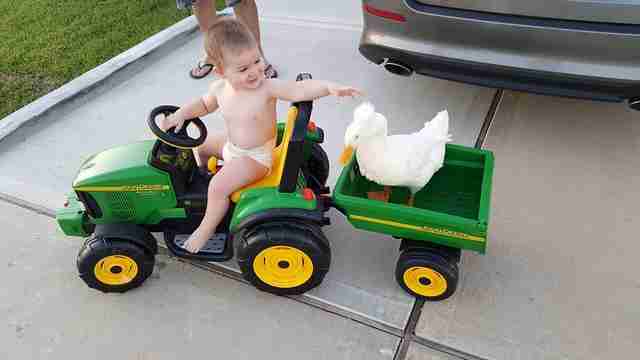 Young has kept pet ducks for many years. She's had a dozen or more of them at a time. But - by their choice - they've mostly been outside pets until Bee. 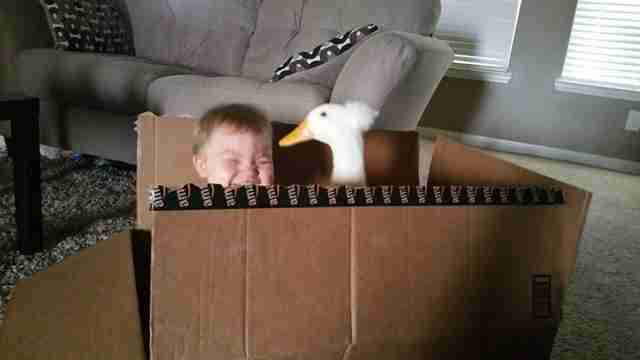 Bee has opened her eyes to how keeping an indoor duck "isn't nearly as weird as it seems." 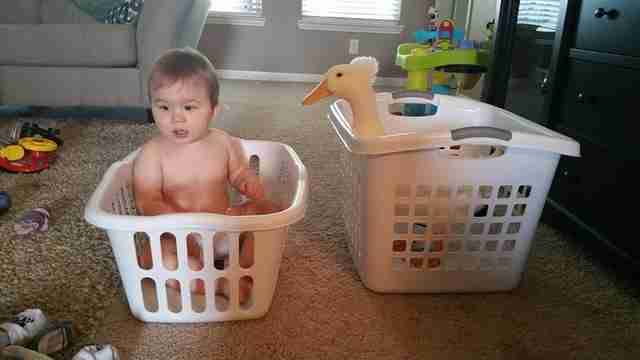 "At first I laughed put loud when I learned people kept ducks inside wearing a diaper," Young says. "Bee is just as loyal, smart, and sweet as any dog or cat." Course, for Tyler, none of this seems strange at all. 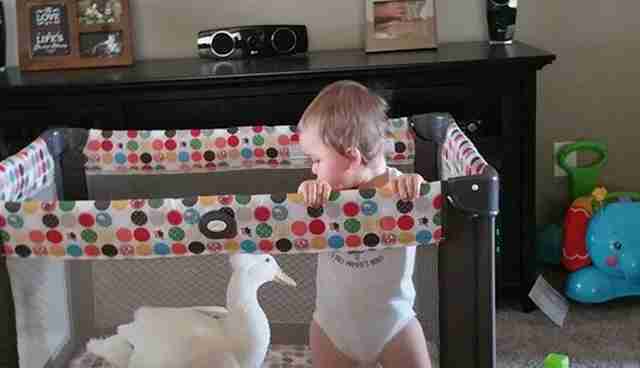 He's never really known life without his feathery, diapered best friend. 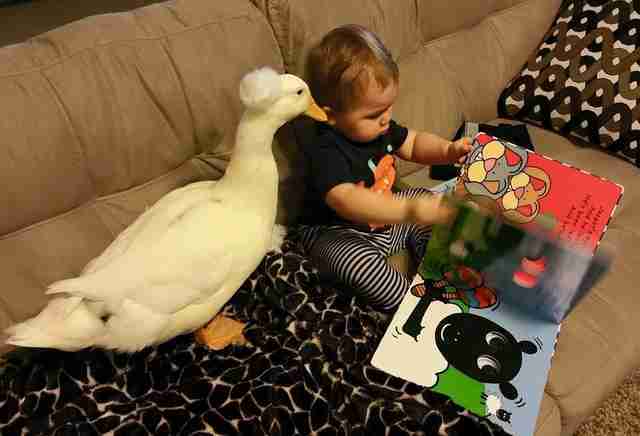 "As far as Tyler knows, having a pet duck is the thing to have," says Young. "He loves his Beaker, and he will tell you just that."